Firstly, I think I've fixed the photo debacle!! I have no idea what happened, how it happened or why it happened but I have replaced the missing photos but didn't add the captions that may have been there before. If you happen to be reading older posts on my blog and notice photos missing, please let me know:-) Thanks! Now onto my Newfo project for March. quickly snapped with my PhotoBooth, sorry about flash! The pattern and fabric strips will go into this little pouch. So that is my Newfo # 3 - March. Linking up with Cat Patches .. head on over to see all of the other Newfo's!! I love that round the world block. It will look great. I have a broken photo link in your post. I can see the strips but not the second photo. 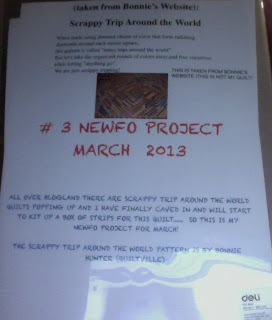 Oooh the scrappy trips quilt will be awesome!!! Glad you got it sorted out. I have been so tempted by the scrappy trip too. I may have to jump in with you. Fun projects! Thanks for linking up today. I have already made one scrappy trips but I think I'm going to have to make another one. They are so much fun and very easy to make! I just may jumped in with you, love the trip around the world scrappy quilt, its next on my list, you will probably beat me though :) have fun!